You know who is feeling better about the economy? Older Americans. Consumer confidence for those age 55 and over hit close to an 18-year high in August. That is helping close the gap in sentiment with Americans under the age of 35, who have long held cheerier views of the economy. It's confirmed. Lead poisoning did happen. Last edited by Jobster; 09-04-2018 at 12:15 PM.. It's more to do that their type of expenses the inflation is relatively under control (healthcare, long-term care, etc..) while their income streams (social security, medicare) are relatively protected as has been the stock market. All of those factors would help bolster the confidence amongst that demographic. On the younger demographic you're seeing skyrocketing housing costs (rental & ownership) cost of tuition and long-term instability amongst job prospects and wage growth. At the same time, economic optimism for those under 35 has been skyrocketing as well. Traditionally the under 35 cohort has always been relatively optimistic. Consumer confidence levels are almost identical among the two demographics you mention. 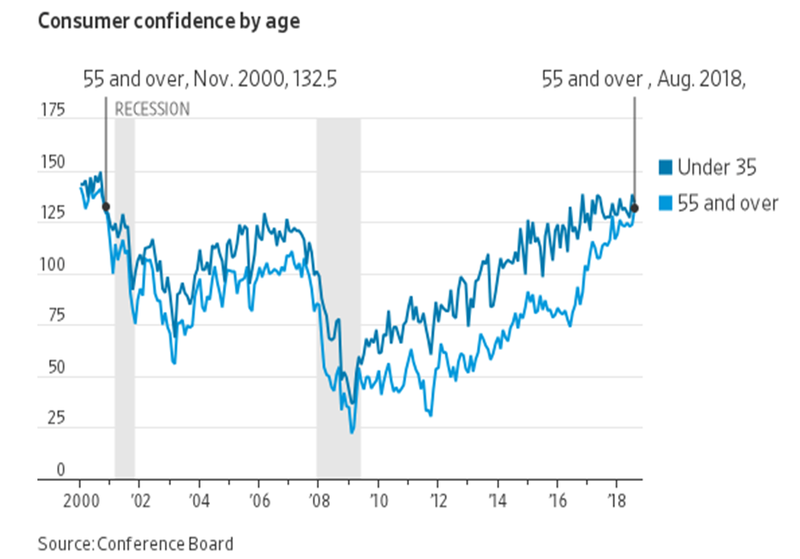 Interesting chart - the last time the confidence levels of the two age groups converged, we were just about to enter recession. I'm glad consumer confidence and the economy is doing well. Not much else is. The reason seniors feel optimistic about the future is that the Obama Administration decided to “save the bankers from the Americans and their pitchforks”. I believe that is pretty close to the exact Obama quote. To protect the banks...Obama bailed them out and then held interest rates low for eight years so that Elites and their banks could survive the financial meltdown. That price was paid by seniors as CD rates went to ZERO for eight long years. It is pretty hard to survive in retirement when you CD’s pay ZERO. That is the MAJOR reason seniors voted for Trump and have no respect for Obama. The Fed bailed the banks. The Fed set the rates. CD rates have been dropping for decades. Even before the recession in the Bush2 years. Seniors have had plenty of time to get educated and adjust. Tens of millions of seniors were protected being on SS at the time of the 2008 crash.